Plus on days when I am running slowly, which happens often at the beginning of runs, you can notice things you wouldn't normally notice. Like somehow in the dark this bridge looks awesome. There are so many angles and the lights are just bouncing off so many different areas. The fox and owl were hanging out nearby, but the fox saw me before I could get my iPhone ready. So the idea for this bread came out during a conversation with Molly when were discussing the problem of having a freezer full of bananas. The question being, what do you make now? I got a little carried away thinking about it...I thought about the bananas in my freezer, the carrots and zucchini in the refrigerator and decided why not? 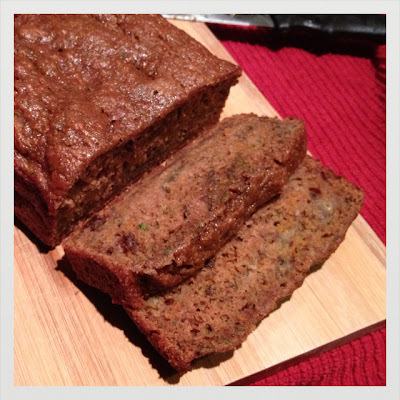 The bread came out dense and moist like your standard banana or zucchini bread. This one is a bit healthier though, with no oil or butter and only one egg! Plus it is jam packed with carrots, zucchini and banana. Basically a great summer bread to have for breakfast. Enjoy! Dry ingredients ready to go: all-purpose flour, wheat flour, salt, baking soda, cinnamon, pumpkin spice and a pinch of ground ginger. Wet ingredients: vanilla, apple sauce, an egg and a little sugar. Mix together and fold in the good stuff..aka banana, zucchini, carrots and raisins. 1. Preheat oven to 350 degrees F. Spray an 9 x 5 inch loaf pan with non-stick cooking spray. 2. In a medium sized mixing bowl, whisk together the flours, cinnamon, pumpkin spice, ground ginger, baking soda and salt. 3. In a large mixing bowl, whisk together the apple sauce, sugar, vanilla and milk until well combined. 5. Spoon batter into prepared loaf pan coated with cooking spray. Bake at 350° for 40-35 minutes or until a wooden pick inserted in the center comes out clean. Cool 10 minutes in pan on a wire rack; remove cake from pan. Cool completely on wire rack before slicing.